CAIRO -- Egyptian media have reacted with fury as Britain and the United States increasingly point to a bomb as the cause of the Oct. 31 Russian plane crash in Sinai, with many outlets hammering home the same message: Egypt is facing a Western conspiracy that seeks to scare off tourists and destroy the country's economy. U.S. Intelligence officials told CBS News on Monday they believe it is "likely" a bomb brought down the Metrojet Airbus A321, and the focus now is more on how it happened and who is responsible, reported CBS News' justice and homeland security correspondent Jeff Pegues. As CBS News reported on Sunday, U.S. Intelligence officials believe it is "likely" a bomb brought down the Russian Metrojet plane. killing the 224 people on board. The warnings of a plot have been widely promoted by opinion-makers in print, online, and on TV, sometimes hinting and sometimes saying flat-out that the West has restricted flights to Egypt not purely out of safety concerns for its citizens but because it wants to undermine the country or prevent President Abdel-Fattah el-Sisi from making Egypt too strong. And though they seem wild, these conspiracy theories have apparently tapped into the Egyptian mindset -- so much so that when Russia last Friday grounded all flights to Egypt, some media speculated that Moscow had fallen victim to British pressure and manipulation. "The people defy the conspiracy -- Egypt will not cave in to pressures," the state-owned Al-Gomhuria newspaper proclaimed in a front-page headline this week. "Egypt stands up to 'the West's terrorism,'" an independent daily, El-Watan, headlined. The rhetoric reflects in part the deep reluctance in the press to level serious criticism or suggestion of shortcomings by el-Sisi's government. Government and independent media alike have constantly lionized el-Sisi and depicted him as Egypt's savior ever since -- as head of the military -- he led the army's 2013 ouster of Islamist President Mohammed Morsi after massive protests against Morsi and the power of his Muslim Brotherhood. Since el-Sisi's election as president the following year, most media have continued to laud him as working to bring stability. "Denial on behalf of the state that there is a crisis and then trying to point to some kind of third party is very normal" in Egypt, Hebatalla Taha, an Egypt-focused analyst at the International Institute for Strategic Studies, told The Associated Press. Conspiracy theories often run rampant in the Middle East for a variety of reasons -- poor education, suspicion of others, a lack of government transparency, limitations on speech, and the historical fact that powers inside and outside the region do often work behind the scenes to sway events and conflicts. Often, the theories are politically fueled. Taha said the rhetoric is the "standard fallback" for the state. Private citizens, she said, likely wouldn't have come up with the conspiracy theories on their own, "but they're very likely to adopt what state media is saying." Egypt's media often point to "foreign hands" amid crises. During the 2011 uprising that eventually toppled Hosni Mubarak, state papers accused foreigners of fomenting protests. Over the past two years, commentators have often accused the U.S. of supporting the Brotherhood, which has been declared a terrorist organization, and trying to impose it on Egypt, in response to Western criticism of Morsi's ouster by the military and the subsequent crackdown on Islamists. They also complain that the West is not helping Egypt enough in its fight against terrorism, including the Islamic State's branch in Sinai, which claimed to have downed the plane. But Taha said the reaction to the plane crash is also rooted in fear. The Oct. 31 crash of the Russian jet just after taking off from the Sinai beach resort of Sharm el-Sheikh could wreck the slow revival of Egypt's vital tourism industry after five years of turmoil -- particularly after Russia and Britain suspended tourism flights, demanding better airport security. 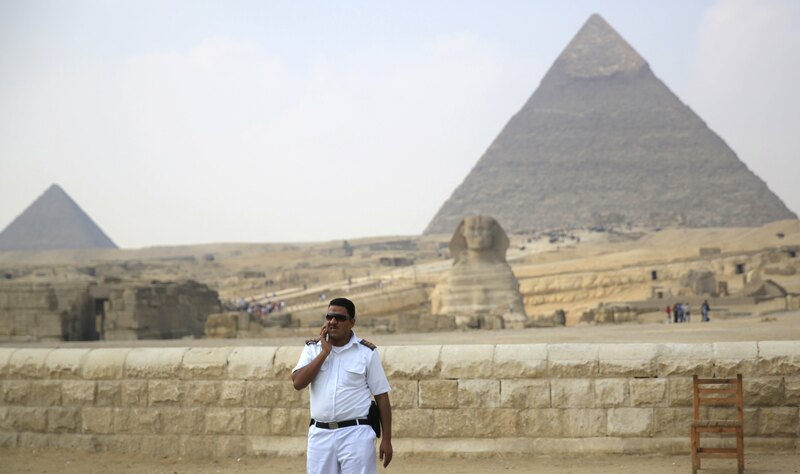 Egyptian authorities have said they are looking at all possible scenarios in the crash. They say speculation should stop until the conclusion of the investigation, which el-Sisi has said could take months. They have bristled at what they call a rush to judgment by British and U.S. officials, who say intelligence suggests the IS branch in Sinai planted a bomb on the Metrojet plane, causing it to break apart in the air, killing all 224 on board. Since Morsi's ouster, the militants have waged a stepped-up insurgency in Sinai and have carried out multiple bombings and killings of police and soldiers in Cairo. Egypt's military has been battling them in the northern part of the Sinai Peninsula. In the Egyptian media, the flight suspensions and calls for better airport security were seen as unfair and malicious. Even if the cause was a bomb, "it doesn't require an instant and large-scale punishment and criminal defamation against Egypt," wrote the editor-in-chief of the Al-Maqal newspaper and one of Egypt's most prominent TV commentators, Ibrahim Eissa. British Prime Minister David Cameron has gotten the brunt of the criticism. Some saw it as particularly insulting that Britain's suspension of flights last week came the same day el-Sisi began his first official trip to London and that Cameron said at a press conference with el-Sisi that it was "more like than not" that a bomb downed the plane. Other commentators went further, hinting at some sort of collusion or at least a mutual interest between Britain and the Islamic State extremists. Hazem Moneim, a commentator with El-Watan, wrote that the West was "afraid" of Egypt. "Why would Britain issue this statement coinciding with the beginning of el-Sisi's visit, as if they know the truth from its source?" he wrote Saturday. He compared it to a TV drama in which "the evil side contributes to committing the crime, then accuses the other side." In the same paper, Lamis Gaber wrote that London "was very pleased" with the IS claim of responsibility. "As long as the English and (IS) are in political agreement and ideological and strategic harmony, then perhaps the information might be true," she wrote. Moscow's decision to suspend its flights as well threw some of the conspiracy theories into confusion, since Russian President Vladimir Putin is always depicted as a strong supporter of el-Sisi. "Even you, Putin?" the newspaper Al-Masry Al-Youm's front page proclaimed. In the largest state newspaper, Al-Ahram, Taha Abdel-Aleem wrote that British and Americans statements on the crash were part of pressure "aiming to empower the Brotherhood and humiliate Egypt, as well as turn public opinion in Russia against its war on terror in Syria" - referring to Moscow's air campaign there. One well-known Egyptian actor even said on a TV talk show that the British prime minister - whom he identified as "John Brown," perhaps muddling the names of previous prime ministers John Major and Gordon Brown - "is in the Muslim Brotherhood." Al-Ahram and other papers also accused Britain of forcing its nationals vacationing in Egypt to leave. Al-Ahram ran a photo of a woman arguing with British Ambassador John Casson at the Sharm el-Sheikh airport, with the caption, "We want to resume our trip and don't want to leave," as if she were saying that. In video footage that has gone viral online, the tourist, Clara Dublin, was in fact telling the ambassador, "We want to go home," angry over the confusion in arranging flights out.